How effective is your project team member in their role? What development needs exist individually or in the project management community? How effective is communication in projects and in the wider company? Does your project sponsor impact positively on the overall project management process? What’s the result? Few people receive open and honest feedback about their performance. That’s where Project Agency’s 360 Assessment Process comes into play. We work with you to help develop the knowledge, skills and attitudes of a given project group. We have a process that really works. It uses existing role descriptions (if you do not have any we will work with you to develop them) to develop a range of questions that are answered by those say in the project team, the sponsor and even some stakeholders. You decide who assesses whom. Each person receives a confidential personalised report and we then have one to one interviews with the target group where the focus is understanding the report and addressing some of the issues within it. 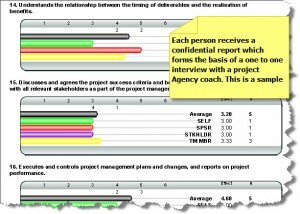 sample 360 report for a project manager – a document that shows how a report is structured. Note: your report may well be similar OR different depending on what you wnat to measure. Project managers and project support staff have complained for many years that the value of the feedback they receive is poor or often non-existent. This 360 process works with you, your project management staff and key stakeholders to really identify strengths, individual and group development needs of this key group of staff. You completely exceeded my expectations. You confirmed good practice & highlighted new / different opportunities.